A Morgan car hire is a terrific and unique driving experience that you won’t forget. You get all the fun of classic car motoring, whilst still benefiting from the reliability and sharp handling of a modern car. 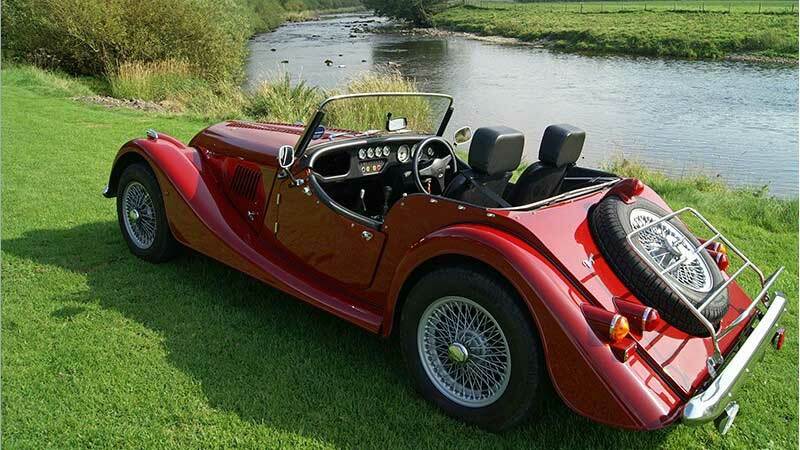 With its fabulous classic sports car looks, our Morgan car will get you noticed. 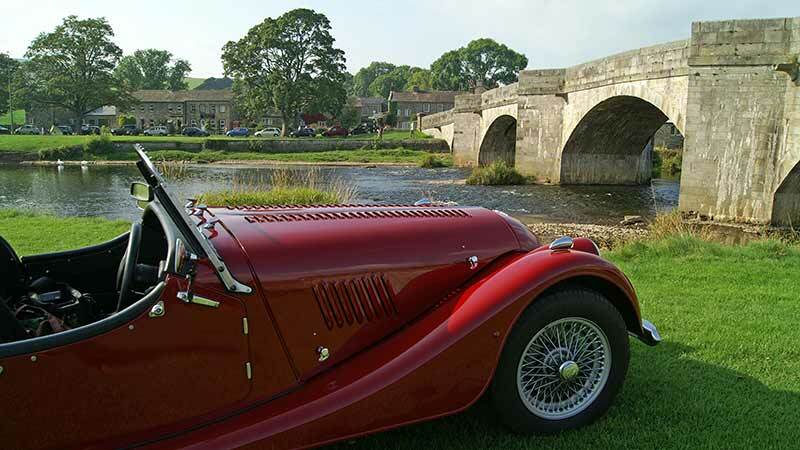 Take the roof down, burble at a leisurely pace through stunning Yorkshire countryside and enjoy vintage style motoring at its best. For a perfect day out, drive away on the winding roads of the Dales, Lake District or North York Moors, our optional picnic basket on the boot rack. For a self drive wedding car in Yorkshire the Morgan is a perfect choice. With its classic looks, open top and beautiful deep red colour, it oozes personality, class and style. Our Morgan 4/4 has a 1.8 litre engine, and a modern manual gearbox and braking system. It has all the performance and nimble handling you would expect of a modern car, whilst still giving you a vintage driving experience. Hire a Morgan car for a day, a weekend or a short break. Open topped Morgan motoring, bringing you close to the elements, is a driving experience that shouldn’t be missed. It’s ideal as a gift for someone special, for fun occasions to remember, or for a classic wedding car. Or hire this legendary hand built sports car to try it before you buy. Painted in Regal red, it has wire wheels, black interior and a black hood. 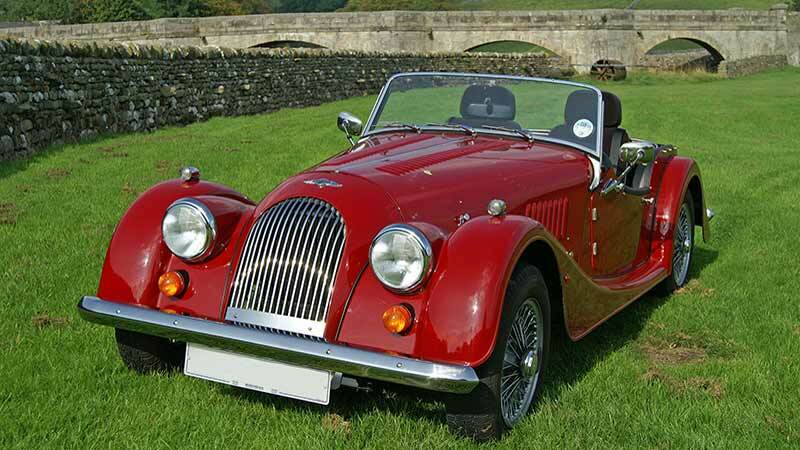 Morgan hire in Yorkshire takes you back in time and brings you classic motoring at its best. Don’t forget to book your Morgan car hire early and have a fantastic driving experience in the stunning Yorkshire Dales or Lake District. We also have a beautiful sunshine yellow four seater Morgan for hire in Cheshire. Morgan sports cars have an impressive pedigree, having been manufactured in the UK since 1910. Originally the factory at Malvern produced three wheelers. The 4/4 was the first four-wheeled Morgan and started life in 1936 priced at £194. It is called a 4/4 because it has four wheels and four cylinders, whereas Morgan’s earlier cars had all until then, been three wheelers with two cylinders. The Morgan 4/4 is still in production today. With its distinctive long louvered bonnet, cowled radiator, sloping wings, cutaway doors and frog-eye headlamps, the Morgan 4/4 is outwardly little changed since the 1950s. It has a steel ladder frame chassis and alloy bodywork over a traditionally crafted ash frame. An innovation from 1986 onwards was the application of Cuprinol during the build process. Whilst the external looks are much the same as they were in 1954, very little else is. The cars have been steadily improved through the use of technology, working alongside the traditional skills. The first production Series 1 Morgan 4-4 two seater dates back to 1936. It was Morgan’s first 4 wheel car, the predecessor being the Morgan three wheeler. Production of the 4-4 virtually ceased during the Second World War and was reintroduced in 1955 with the 4/4 Series 2. 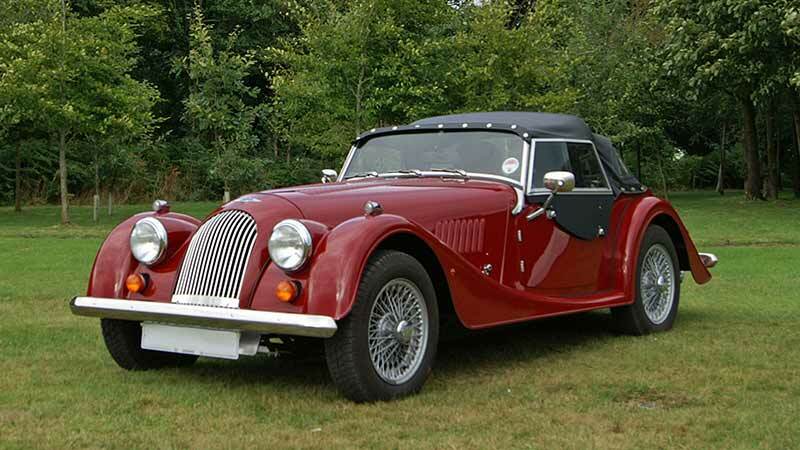 Morgans were a lightweight sports car and came in any colour you liked. The Morgan Motor Company do not build their own engines. Thus engines have come and gone, the thirties cars using side-valve Ford engines. Coventry Climax and Standard 10 engines were also used on early cars. Later models used mostly Ford, but even Fiat engines. Thirties style aluminium body and wings. From the late seventies you had a choice of a steel body, or an aluminium body at extra cost. Later in the production all 4/4 bodies were aluminium. Steel chassis and Ash frame body, Marine ply floors. The frame is now pressure treated and Cuprinol dipped. Sliding pillar independent front suspension. Sliding pillar was an early form of suspension used on a number of cars at the turn of the previous century such as the Lancia Lambada. 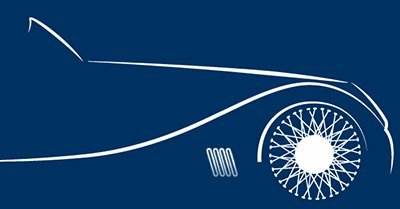 In 1909 HFS Morgan designed and patented a variation of the sliding pillar which is still in use on Morgan cars today, and forms part of its character. Power assisted. Disc brakes on the front, drum brakes on the rear. There is a small space behind the seats for hand luggage but there is no boot. 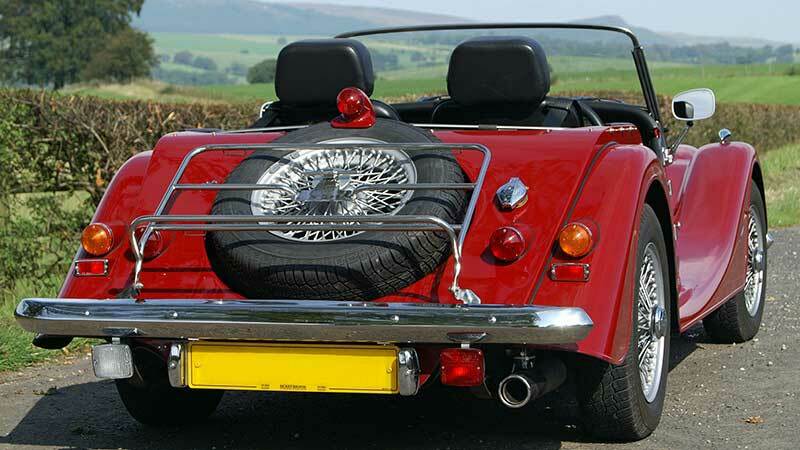 Our Morgan has a boot rack for suitcases and we provide a waterproof boot bag, but luggage space is pretty limited. Regal red with black upholstery. Manual hood with side screens. Heated windscreen. Our Morgan hire car is available for collection in Keighley, West Yorkshire, not far from Skipton, the ‘Gateway to the Dales’. Our location is within easy reach of all the major towns and cities in the north of England. We are in an ideal location for Morgan car Hire Leeds, Bradford, Huddersfield, Halifax, Wakefield, Sheffield, York, and Harrogate. For Morgan car hire Preston, Blackburn, and Burnley you don’t have too far to travel either. We are within an hour’s drive of most of the towns in Lancashire via the M65 or A59. Once you’ve collected it you can drive our Morgan hire car anywhere in the UK subject to our terms and conditions.